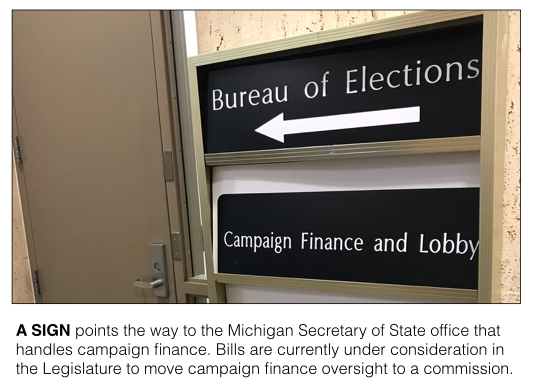 LANSING (DEC. 10, 2018) — Compared to other states, Michigan would have a one-of-a-kind system for enforcing and administering campaign finance laws under bills advancing in the Legislature’s lame-duck session. According to a review of campaign finance laws across the country, the proposed system for Michigan is unique because it gives the power to a commission with an even number of members whose selection would depend on the preferences of statewide political parties. 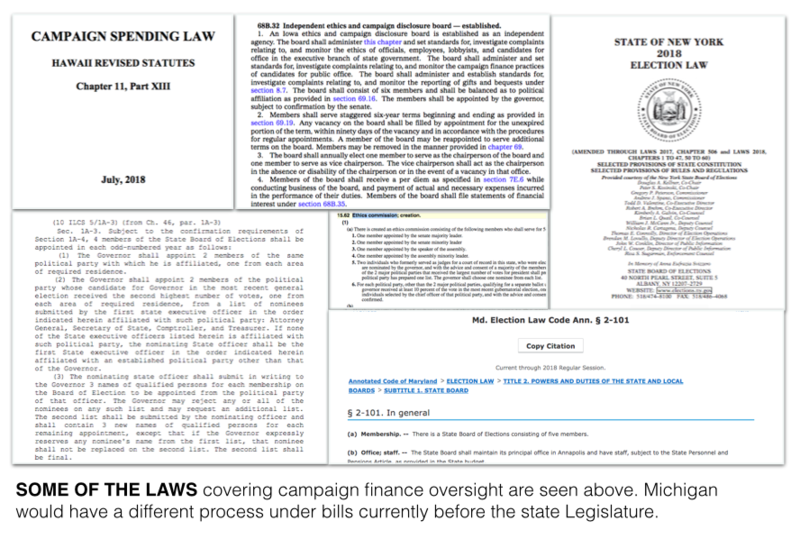 The Michigan Campaign Finance Network arrived at this conclusion after researching the systems of other states using summary information from the nonprofit Ballotpedia and in some cases, examining the text of other states’ laws. Currently, the Michigan secretary of state, who is up for election every four years, is in charge of administering the state’s campaign finance laws and making sure disclosures are available to public. New bills, which passed the state Senate on Thursday, would shift those responsibilities away from the secretary of state and would give them to a six-person commission featuring three Republicans and three Democrats. It would take four votes for the new commission to act. The governor would appoint the commission’s members based on lists provided by the state’s political parties, which are some of the most active political spenders in Michigan. The commission would then have to make decisions about penalties for campaign finance violations and about how to interpret laws when new situations arise. Republicans have held the secretary of state job for 24 years. In November, Michigan voters elected Democrat Jocelyn Benson for the position. The GOP-supported bills come as Benson is about to take office in January. As a disclosure: MCFN’s executive director, Craig Mauger, testified against the bills during a committee hearing last week, citing concerns about the commission’s ability to enforce campaign finance regulations and to ensure disclosure data is available for MCFN to pursue its mission. Sen. David Robertson, a Republican from Grand Blanc, is the sponsor of the bills, the main one being Senate Bill 1250. He has emphasized that many other states use a commission to enforce campaign finance laws and that the new Fair Political Practices Commission would have to act in a bipartisan fashion. MCFN’s analysis shows that while the idea of a commission is not unique, no other state has a commission with the same powers and an even number of members so directly influenced by the statewide parties. Out of the 49 other states, 18 states give the power to oversee campaign finance to the secretary of state, to the attorney general, to some other individual state official or a combination of state officeholders. In many states, like Wyoming and North Dakota to name two, the secretary of state is in charge of campaign finance reporting while the attorney general is in charge of enforcement, according to Ballotpedia. According to MCFN’s analysis, 31 states use some type of a commission to either oversee campaign finance with the help of another official or to oversee campaign finance on its own. In 21 of those states, the commission features an odd number of members, making it likely less that the commission will deadlock on key votes. In floor a speech last week, Michigan state Sen. Rebekah Warren, a Democrat from Ann Arbor, said the Michigan Legislative Service Bureau, which helps lawmakers draft bills, had previously encouraged her against having even-numbered boards to avoid deadlock. "That's exactly what we're creating here," Warren said. In many of the 21 states with commissions with an odd number of members, the governor gets to appoint the majority of commission members. In Hawaii, for instance, the Hawaii Campaign Spending Commission features five members appointed by the governor from lists of nominees submitted by that state’s Judicial Council. In Maryland, the Maryland State Board of Elections has five members. The governor appoints the members with the advice and consent of the state Senate. Three members belong to the majority party. Two belong to the minority party. With 18 states using statewide officials and 21 using, at least in part, commissions with an odd number of members, that leaves 10 states that use commissions with an even number of members, somewhat like what’s being proposed in Michigan. 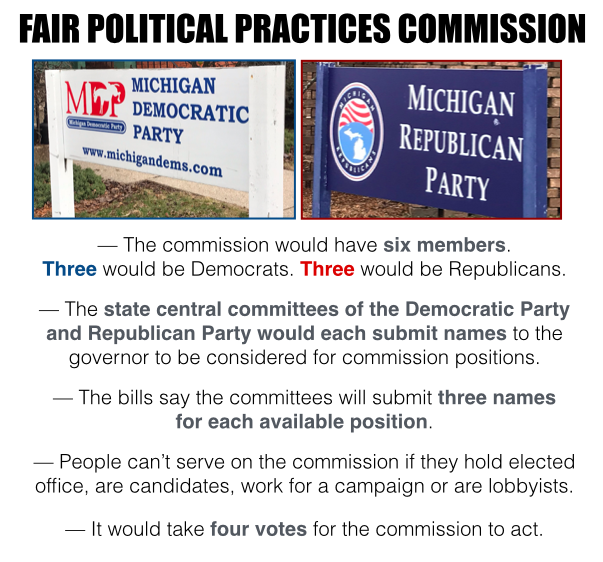 While the Michigan proposal forces the governor to pick from nominees from the state parties, the 10 other states have different ways to select commission members or other setups that differentiate them. For instance, the Iowa Ethics and Campaign Disclosure Board is a six-member commission, appointed by the governor with only three being from one party. However, the board currently includes three Republicans — the governor is a Republican — one Democrat and an independent, according to its website. The independent is a former journalist, according to the board’s website. In Indiana, the state has a four-member commission appointed by the governor but nominated by the chairpersons of the state’s political parties. However, the Indiana Election Commission is a bit different because it's in charge of investigating violations while the Indiana secretary of state is in charge of administering campaign finance law. The states whose systems are most similar to what’s being proposed in Michigan appear to be New York, Missouri, Wisconsin and Illinois. But even those states don’t vest power to select members so heavily in the statewide parties. New York has a four-member State Board of Elections, appointed by the governor. Two of the members are recommended by the chairpersons of the state’s political parties. The third is recommended by majority legislative leaders, and the fourth is recommended by minority legislative leaders, according to the state’s law. In Missouri, it’s the political parties’ congressional district committees that have say. Congressional district committees can operate much differently than statewide parties. Each district committee submits two names, and the governor picks six individuals to serve on the commission from the nominations. The commission members have to be from different districts, and no more than three can be from the same party, according to that state's law. In Illinois, there’s the eight-member Illinois State Board of Elections. The governor appoints four of the members from his or her party, and the highest ranking executive official of the other party submits a list of nominees from which the governor picks the other four members. Finally, in Wisconsin, lawmakers put in place the Wisconsin Ethics Commission in 2015. It also has six members. The Senate majority leader appoints one. The Senate minority leader appoints one. The Assembly speaker appoints one. And the assembly minority leader picks one. The legislative leaders of the two major parties then nominate former judges for the governor to choose from for the two other positions.